Sottocategoria di macchine Centro di lavoro a C.N. Determina ora il valore di mercato della sua Centro di lavoro a C.N. con WOOD TEC VALUE. Gratuito, veloce e senza impegno! Offerte per Centro di lavoro a C.N. Termini tecnici a Centro di lavoro a C.N. 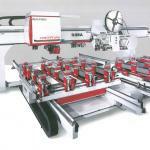 The term CNC-machining centre is not standardized and got re-interpreted in the course of time. Today this term describes mostly all stationary CNC-controlled tool machines with at least 3 linear axes in woodworking industry. 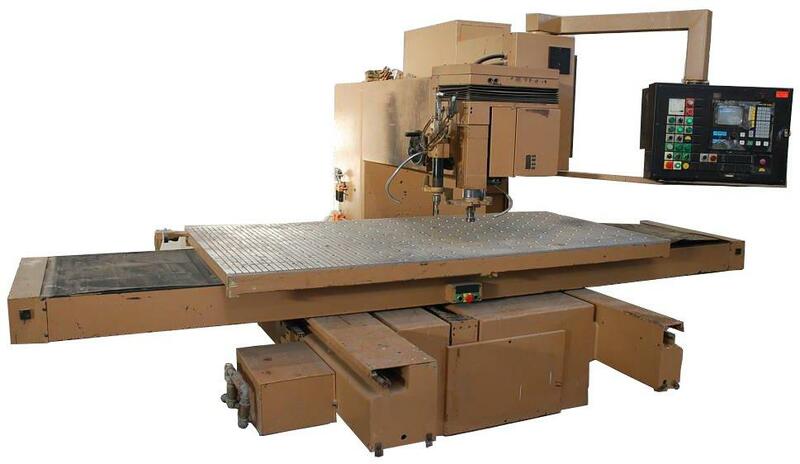 Even though CNC-controlled beamsaws, edgebanders and many other kinds of machines with CNC-control exist, in practice the CNC-machining centre is known as "The CNC machine" or "The CNC". Meanwhile this designation as synonym for CNC-controlled stationary tool machines has become a standard term ,so that it is partly found in specialist journals and literature, too. Todays CNC-machining centre developed from 2 kinds of stationary CNC-controlled tool machines - the CNC-router and the PTP-boring machine. 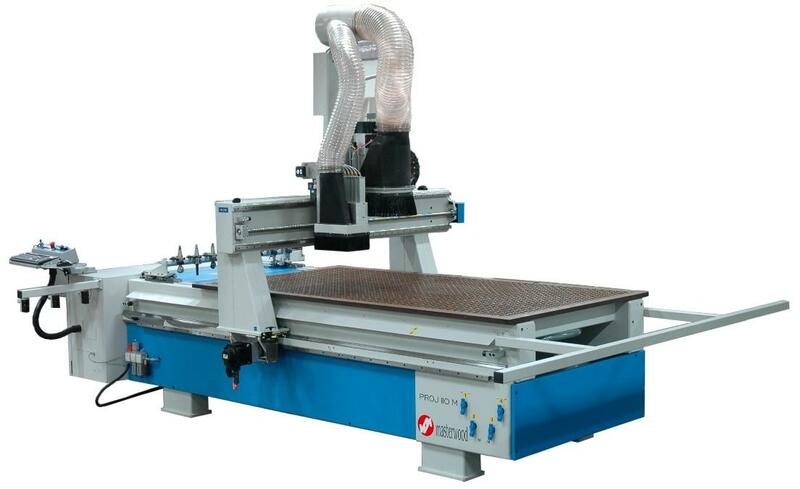 The CNC-router developed from the classical router, which was able to produce free moulded workpieces by the use of stencils. 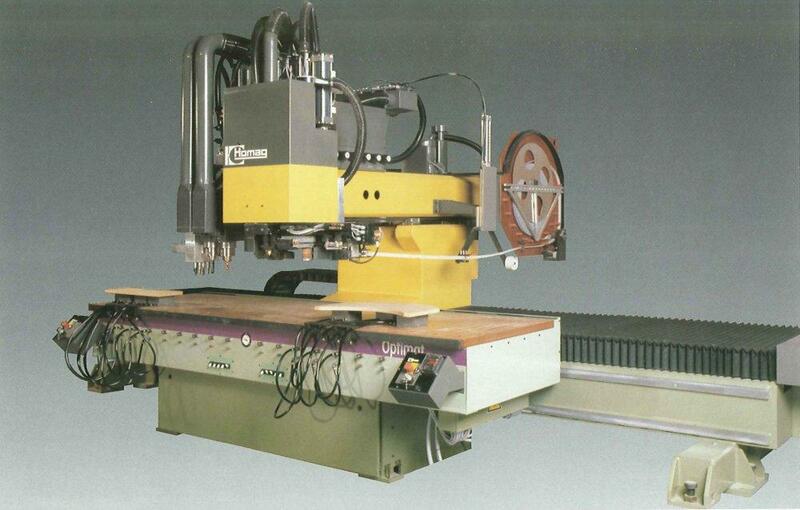 In the 1960s the japanese manufacturer Shoda Ironworks launched the first CNC-controlled router for wood processing. 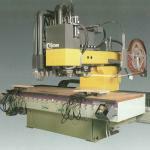 Shortly thereafter the first european CNC-machine was marketed by company Bulleri. Parallel, since the beginning of the 1970s different companies developed PTP-controlled boring machines; in colloquial German these machines were not called CNC. In many european and asiatic countries the term "PTP-machine" or "Point-to-Point" has become established and is partly used instead of the term "CNC-machining centre", even if the machine has a milling aggregate and a continuous path control. 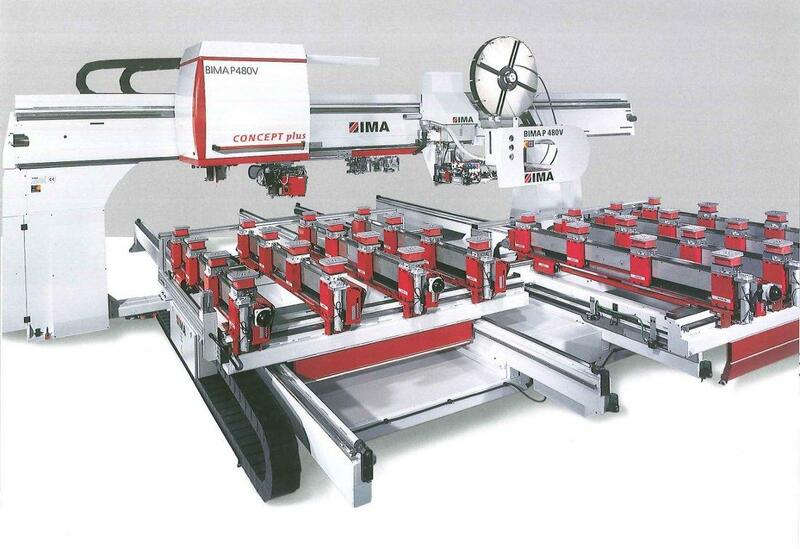 At the end of the 1980s the companies Homag and IMA launched approximately at the same time CNC-stationary machines with edgebanding aggregate. 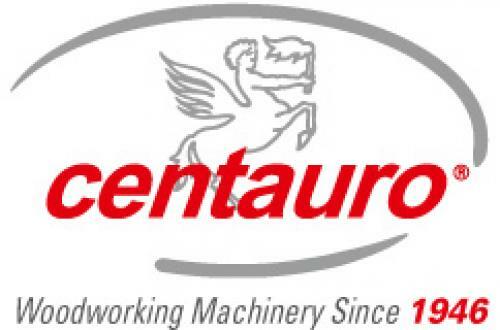 For the first time these machines were officially designated as CNC-machining centres. By this time many other manufacturers marketed new kinds of machines too. Either the up to now produced PTP-boring machines were equipped with an additional router head and if necessary with further aggregates (e.g. Biesse, Morbidelli, Weeke) or the up to now produced CNC-routers got additional boring units and the possibility to add further aggregates (f.e. lock case milling aggregate e.g. Maka, Reichenbacher, SCM). Because of the necessity to integrate several function units in one machine, to a great extent, the use of aggregate supports gained acceptance. Through the introdcution of the "official" CNC-machining centres and the simultaneous spreading of CNC-controlled multi function machines, the term CNC-machining centre became established for this whole group of tool machines in wood processing. A CNC-machining centre consists fundamentally of 2 elements: a machine table, onto which the workpiece is clamped and one unit, which picks up the aggregates support. 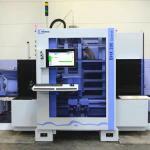 The version of this unit is the essential distinctive feature of the construction forms of CNC-machining centres. 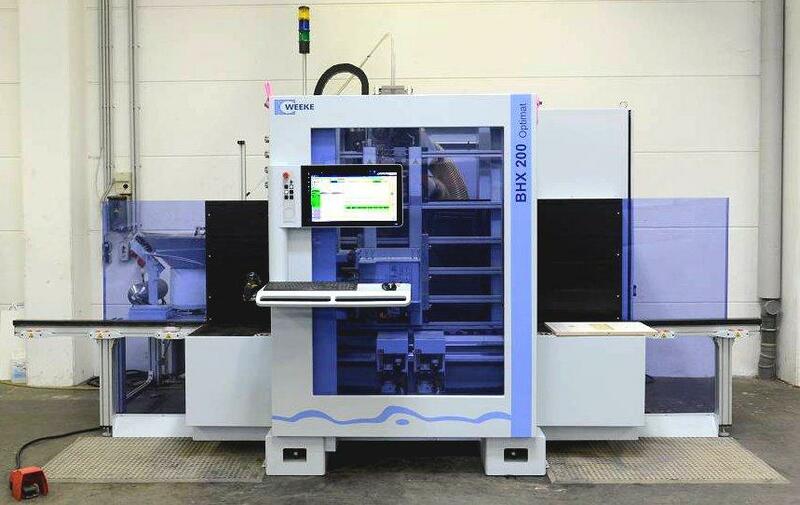 Shortly after the initial introduction of the term and the simultaneous distribution of CNC-controlled multi-function machines the terminology "CNC-machining centre" established itself for all stationary CNC-controlled tool machines in the woodworking. A CNC-machining centre basically consists of 2 elements. A machine table, on which the workpiece is getting clamped on and the machine construction, which takes the unit carrier. 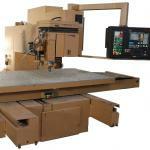 Machine table and machine construction are the most important distinctive features for CNC-machining centres. There are three basic construction types of machine tables, the console table, den matrix table und den smooth table. Furthermore there are unaccountable special solutions and camping systems which cannot be categorized and are mostly constructed for one particular usage. 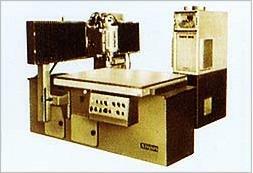 Until the mid 00's machines with a vertical worktop were merely a niche product, but were able to keep up on an own market around 2010. Here it's not a construction type of the table, though, but an arrangement, as vertical machining centres can have miscellaneous types of tables. Until the early 1990s at some machines with a fixed table and moving tool these units were completely separated from the machine table. Through the complete decoupling of both elements unintentional oscillations should be eliminated for maximum quality of processing. Due to high space requirement and material costs this construction form nearly disappeared. The matrix table (or groove table) is a closed panel, which an even grid of grooves are milled in. Within these grids there are sealable apertures through which a vacuum can be sucked. Forments of sponge rubber can be laid on the grid so as a certain area is sealed. When all apertures for that vacuum are closed, a workpiece can be laid upon it, which is sucked in over the entire area. The advantage is the extensive and the low vibration edition of the workpiece as well as the free selection of the sealed form. The disadvantage is that a complete formatting of the workpiece and a horizontal processing without collision between tool and machine table is only restrictedly possible. The console table doesn't have a table board. Here there are linearly moving cross members (the consoles or traverses) in the machine bed. On these cross members suction cups will be put on which will clamp on the workpiece. With modern machines the vacuum will be sucked through the console, so as the table form can cope without hoses in the area of the caution positioning. The advantage is the use simple for the operator, especially with clamping rectangle panels, as well as the good accessibility for horizontal processing with modern machines. The console table can be equipped the most flexible with miscellaneous accessories and entirely automatized. A disadvantage is the clearly complex construction and thus possible sources of mistake. An additional disadvantage is the restricted ability for positioning the suction cup. As a matter of principle, at this table form the suction cups can be positioned well freely, which requires an additional technical device. This construction principle arose mid-2000's. To be exact, it's not a table form, but a sort of workpiece transport. As the gripping pliers simultaneously represent the clamping system, the actual machine table is here irrelevant. With machines with gripping pliers, the movement of the X-axis takes place through the clamped workpiece. 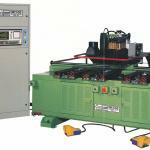 These machines facilitate mostly relatively high speed of operation with comparable cheap prices. The machine framework can be built significantly easier as the x-axis not doesn't have to process a complete machine piece, but just only the workpiece. 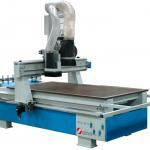 In principle CNC-machining centres exist in 2 construction forms: The gantry machine and the cantilever type machine. The gantry machine can be in turn characterized in 2 form: the moving gantry machine or moving gantry as well as the fix gantry maschine. As with the machine table, there special forms of the machine framework, which represent niche products or customized individual construction. All linear axles are created through the movement of the tools. The double-sidedly stored gantry processes via a fixed machine table. This construction form facilitates a comparably vibration-low workpiece processing and is utterly space-saving. The disadvantage is the workpiece not being wider than the machine table can be. Because of the new EU-security regulations of 2007 this construction type has been widely spread ever since. Machine table and gantry are mostly mechanically connected. On a fixed gantry the unit carrier is located. A linear axis will be created through the movement of the machine table. This construction type facilitates the especially vibration low workpiece processing but requires significantly more space than any other types of construction. A single-sidedly stored cantilever takes action on the back side of the machine. The machine table is stationary. The advantage is the good accessibility of the machine table and the possibility to put on workpieces bigger than the machine table. The disadvantage is the increasing susceptibility to vibration at the open end of the cantilever. Also with cantilever machines, two different construction types had existed until into the early 90's. 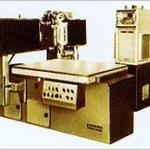 The first CNC-controlled routers were constructed based on the usual machines in the metal industry. With this construction type the cantilever is fixedly arranged and the machine table is moved horizontally on two axis. The tool will be merely delivered in the deep. 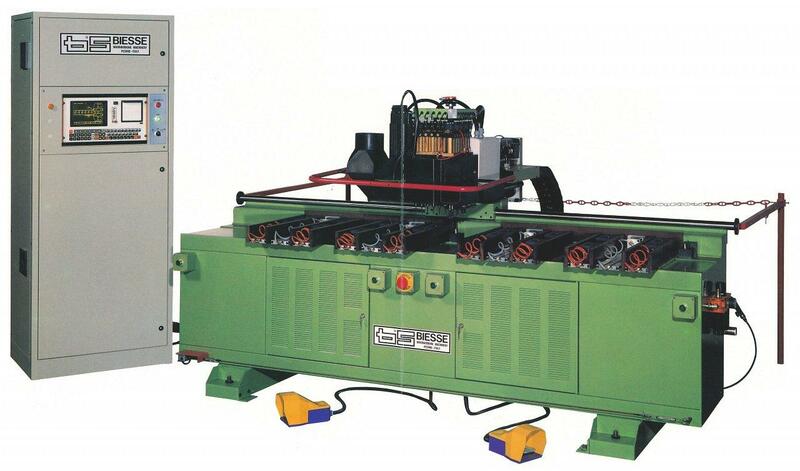 This construction type is called "cross table machine". The disadvantage is that the table requires at least twice its actual length for space, so that all in all for the movement of the machine table, fourth the size of the area will be needed. Because of the high demand for space with relatively small work space, such machines have been only produced for difficult milling processes during the 80's and vanished completely off the market during the 90's.